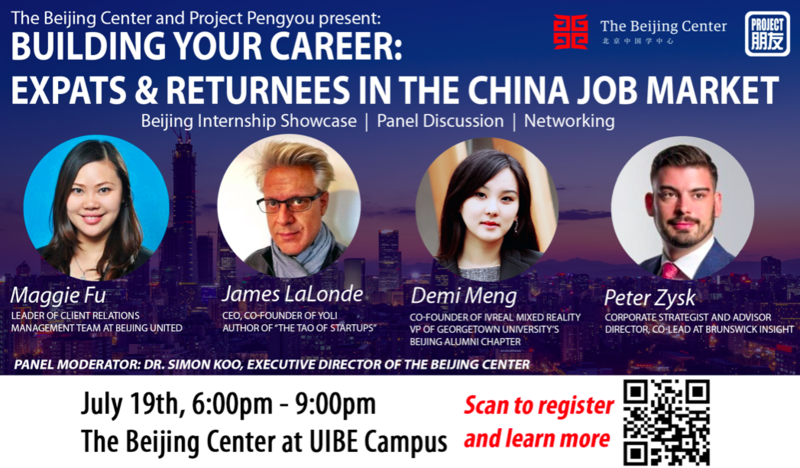 Project Pengyou and the Beijing Center invite all students, interns and young professionals to join us in Beijing, July 19, 2018 at the Beijing Center for an evening internship showcase, panel discussion and networking reception! Project Pengyou is pleased to partner with The Beijing Center for Chinese Studies to cohost the Beijing Center’s Internship Showcase! The event will bring together the U.S.-China exchange community, highlighting the efforts of student interns and their host organizations. Each participating intern will create a poster to display and have the chance to share the great work that they are doing. Following the internship showcase, there will be a panel discussion including speakers from a variety of fields, experiences, and professions (read more about the speakers below). This will be an excellent opportunity for students, interns, and job seekers to learn from those who have build their own career in China across a variety of industries. Don’t miss this chance to connect with other young professionals and students – possibly even future colleagues and mentors. Finally, after the panel discussion, there will be a networking reception. We encourage all young pengyous to join us at the Beijing Center’s beautiful library for an evening that is sure to be fun, educational and productive! Panel Event “Expats and Returnees inthe China Job Market”: 7:30-9:00pm. What are the reasons behind the talent demand shift in China? Identify new opportunities for expatriates and what it takes to succeed in China. Demi Meng is a venture investor and entrepreneur in VR/AR/MR arena and now the Co-Founder of iVReal Mixed Reality and Venture Partner in New Frontier Investments. Demi was the first supervisor and manager of the $18Bn Virtual Reality Venture Capital Alliance (“VRVCA”) at HTC Vive. She was previously a technology equity researcher at Oppenheimer & Co. and a venture investor at Westbound Capital in New York. She once worked at Financial Consulting Dept. at Accenture Beijing, US family office foundation–SunBridge Capital Management and IFC (World Bank Group) South Africa Project. She holds an Master’s degree of Telecommunications Engineering from Beijing University of Posts and Telecommunications and an MBA degree from Georgetown University. She also holds the Vice President position of Georgetown University Alumni Association Beijing Chapter. Peter Zysk is a data-driven strategist who co-leads Brunswick Insight’s Asia practice, which provides opinion research and analytics for business-critical decisions. Peter helps clients build better communications programs that are grounded in data and insight. He advises leading Chinese and Asian companies on their international expansion strategies and works with multinational companies to strengthen their positioning in Asia. Before joining Brunswick’s Beijing team, Peter spent four years in the firm’s Washington, D.C. office where he helped to build the opinion research practice in the U.S.
A big thank you to our sponsor for this event, The University of California Education Abroad Programs, as well as our Media Partners, Beehive (a student initiative at the University of International Business and Economics in Beijing, follow their official account on wechat: BeHive) and JingJobs!